The bold one. If you are expecting the sweet flavor of italian (standard) basil, you are going to be surprised. Although they are cousins, they couldn’t be more different. With its peppery flavor, it pairs really nicely with meat dishes. Want to wow the crowd with a little fancy? Garnish any South Asian dish with a deep-fried Thai Basil leaf— yep, you heard us right. Deep fry those leaves for wow-worthy flavor! Sold at the peak of freshness. 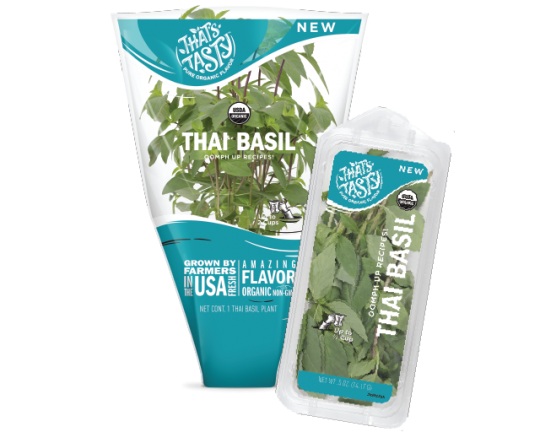 Our thai basil is grown and sold to be used right away for the best flavor. Thai the knot with the unbelievable flavor! Freeze pureed thai basil in ice cube trays with a little organic grapeseed or peanut oil. These little favor bombs are perfect to quickly add flavor to a stirfry. Just drop a few in the wok/pan as your cooking. Make some fresh thai basil iced tea! It’s a refreshing drink that is also an aid for digestion. Place in a glass jar with water and place in the sun. In a couple of hours you will have a nice thai basil sun tea. We love to add some watermelon chunks as well to make an amazing picnic ready drink!